I recently had one of my clients ask me for some guidance in migrating a massive website (with pages numbering in the tens of thousands) from their hand coded bespoke platform to a professional CMS. Josh Farkas, from Cubicle Ninjas, is my go to person for any and all advanced, highly technical or customization issues. To help the client weed through CMS options, Cubicle Ninjas put together the following documentation outlining the differences across the three primary platforms (WordPress, Drupal & Joomla). Cubicle Ninjas is pleased to help make the decision-making process easier by offering researched benefits and perceived weaknesses of the top three content management system (CMS) platforms. It is our mandate to present only facts about Drupal, WordPress, and Joomla to help enable you to make the most educated and informed decision about your content management system. After reading the above article excerpt, deciding which content management system (CMS) to power your new website is probably more puzzling than ever. Yet selecting the most appropriate CMS to create, maintain, and sustain your website may be the most critically important decision made regarding the creation of a site. For instance, if your short-term goals are perfectly aligned with one CMS, but that same platform is seemingly unable to meet your future requirements, you’re considering the wrong CMS. This is why there are two key factors to consider when searching for the perfect platform for your needs. First, when selecting a CMS, it’s imperative to thoroughly understand what strengths and weakness each platform brings to the table today, as well as their planned, future technological trajectories. Secondly, to make the right decision relies a great deal on you having a thorough understanding of the scope, complexity, depth, features, and functionalities of your site, both in the short- and long-term. Once you’ve done your due diligence researching CMSs and have cemented your website’s intentions, requirements, and goals, the confusion surrounding the CMS decision will begin to dissipate and the choice will become much more clear. 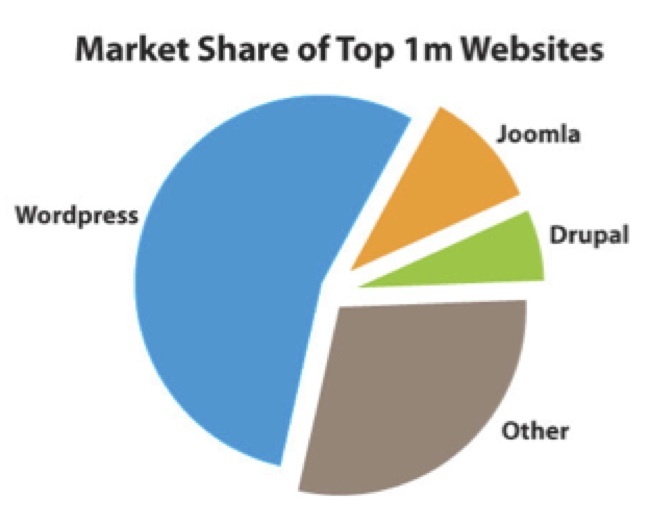 When combined, Drupal, WordPress, and Joomla content management systems (CMS) control approximately 75% of the total CMS market share. These three CMS giants are all open source systems, meaning they are free of charge and downloadable from the Internet. In addition all are built on PHP + MySQL and manage content with databases. Their differences, however, far outweigh their abovementioned similarities. Though there are obviously many shared attributes amongst two out of the three CMSs, each one has its unique strengths and weaknesses. The synopses that follow are intended to be informative overviews of Drupal, WordPress, and Joomla. Prior to selecting a CMS, Cubicle Ninjas strongly recommends further investigation into the one or two that pique your interest and appear to meet your website’s requirements both today and far into the future. Benefits: Often referred to as the ‘granddaddy’ of CMSs for its powerful backend that can support hundreds of thousands of pages and millions of users a month, Drupal has also been around the longest having been first released in 2001. With its unparalleled power, it can support the creation of multiple content types, each with hundreds of fields, and it presents unlimited ways to capture, organize, and present data for a wide range of applications. With its flexibility, power, and scalability Drupal is ideal for developing complex, big-budget, large-scale websites. In addition to being the most secure CMS on the market today, experiencing the least number of exploits and hacks, this CMS also provides granular control over who can access and edit every aspect of the site. One of the newer features of this CMS is that it automatically creates responsive sites (Drupal 7). Drupal administrators and users are also fortunate to have strong, well-maintained support communities and forums for problem-shooting and solving issues. One of the most flexible and powerful CMSs available for developing complex, big-budget, large-scale projects. Supports creation of multiple content types, each with hundreds of fields. Powerful backend that can support hundreds of thousands of pages and millions of users a month. Automatically creates responsive sites (Drupal 7). Most secure and experiences the least number of exploits and hacks. Granular control over who can access and edit every aspect of the site. Scales effortlessly and is stable. Unlimited ways to capture, organize, and present data for a wide range of applications. Strong well maintained support communities and forums. Perceived Weaknesses: With all Drupal has to offer it may come as a surprise to learn it is only used by 5.7% of all websites created using content management systems. Why such a low percentage when the benefits are so many? Because Drupal is also, without contention, the most difficult and technical of the three CMSs. More often than not, creating and launching a website with Drupal requires IT professionals as this program lacks editor tools such as WYSIWYG and uses code instead. With its foundation in code, Drupal is difficult to use for those without technological backgrounds or knowledge and the learning curve is so steep it may as well be vertical. Posting requires setting options for URL Alias, Menus, Revision Logs, Comments, and Author Meta data, most of which are completely foreign to the average layman. In addition, Drupal lacks themes that mean great designers are necessary to make the site visually captivating. It also has the smallest number of plugins, modules, and extensions. Drupal also lacks strong support communities and forums, making developers rely on the company’s main documentation. All of these factors make Drupal the most costly to develop and maintain. Difficult to use for those without technical backgrounds/knowledge. Developers forced to create their own solutions. Lack of themes (great designers necessary). Posting requires setting options for URL Alias, Menus, Revision Logs, Comments, and Author Meta data. Lacks in terms of unofficial support beyond the main documentation. Organizations that use Drupal as their CMS include: the White House, The Economist, MTV, Optima Bank, PInterest, London.gov.uk, NYU College of Nursing, the Onion, and the US Dept. of State, Bureau of Educational and Cultural Affairs. Benefits: What started as a blogging platform in 2003, WordPress has evolved to be used as a full content management system and so much more through the use of the thousands of plugins and widgets and themes. The biggest selling points of WordPress are that it’s easy to install, administer, and to add popular and common features. It is also the ideal CMS for those with little to no technical know-how and learning this CMS couldn’t be easier. Utilizing a WYSIWYG editor (as opposed to code), makes changing, deleting, modifying, adding, and editing content and images simple to learn and simple to execute. Websites using WordPress can be customized through the use of nearly 15,000 (yes, 15,000!) widgets, plug-ins, and modules, and with its stable plug-in API architecture it’s easy to develop your own plug-ins. Factors definitely not to be overlooked are WordPress’ strong SEO capabilities and extensive support via Google searches. The ease and flexibility to create mobile, tablet, and desktop themes of high customization is also a unique benefit (though they must be built-in by the developer). Last, but certainly not least, WordPress is a highly flexible CMS, enabling people of all technological backgrounds the ability to create blogs, eCommmerce sites, websites, and more. Though impossible to pinpoint exactly why 58.8% of all websites created with content management systems, or 20.2% of all websites, use WordPress, ease of use would most likely be at or near the top of the list. In total, a WordPress site is filled with the latest technology at an affordable price. Easy to add popular and common features. Easiest learning curve; ideal for those with little to no technical background. Does not require coding to edit. Easy posting using WYSIWG interface. Websites can be completely customized through the use of widgets and plug-ins. Most extensive number of extension vendors and themes. Extensive support via Google searches. Perceived Weaknesses: Being based on blog platform architecture poses some hardships, such as limited content management capabilities. Plugins are often required to add or enhance built-in features. An example is that while WordPress was created to be a discussion forum it still requires a third-party plugin to have granular control over who can access and edit every aspect of the site. Because of this reliance on plugins (and the systems popularity) there remains the possibility of insecurity, requiring updating of the platform and its plugins on a regular basis. And in a time when optimized websites are a must, WordPress does not automatically create responsive sites. The theme developer must currently create responsive themes. Solutions for problems can usually be found doing a simple Google search, but unlike Drupal and Joomla, WordPress has significantly higher online support. Finding solutions is usually more streamlined than with other platforms. Requires a third-party plugin to have granular controls. Must be updated with latest plugins and WordPress versions for security purposes. Blog platform architecture poses difficulties unless planned. Limited content management capabilities without plugins (due to blog platform architecture). Doesn’t automatically create responsive sites. Organizations that use WordPress as their CMS include MSNBC TV, Tribune Media Group, Best Buy, Forbes Blogs, Xerox, Brazilian Culture Ministry, Wheaton College, and NY Times Blogs. Benefits: First released in 2005 after forking from Mambo, Joomla is one of the newer kids on the CMS block but it’s quickly established itself as a major player. Today 3.3% of all websites, or 9.5% of all websites built on a content management system use Joomla. It is considered a wise choice for those who fall between tech-pros and tech-newbies, as it’s easy to install and automatically creates responsive sites. With its strong content management capabilities, thousands of features and designs, and an extensive plugin (‘extensions’ in Joomla-talk) library, this CMS offers a great deal to people across a broad spectrum of technological knowledge. And if questions or problems arise, Joomla has strong, well-maintained support communities and forums. Google Analytics also comes included free of charge. Ideal for those who fall between tech-pros and tech-newbies. Thousands of features and designs. Perceived Weaknesses: There is a rather steep learning curve, particularly regarding our new site’s functions and general usage. This combines with the fact that posting requires HTML/code, the inability to allocate different web pages to different CSS, and the lowest number of plugins, modules, and extensions of the three CMSs, makes Joomla somewhat difficult for the average layman to use. From a technical viewpoint, Joomla lacks elements critical for on-site optimization, it’s not search engine friendly particularly with regards to URLs, and an SEO plugin must be purchased for SEO optimization. Customization of sites is limited, as is the Access Control List (ACL), which refers to a list of permissions that can be granted to specific users for specific pages. Steep learning curve, particularly the functions and general usage. Lacking elements important for on-site optimization. Not ideal for large-scale websites. Commercial presence of mods & themes not the most extensive. Not search engine friendly particularly with regards to URLs. Must purchase SEO plug-ins for SEO optimization. Limited Access Control List (ACL) refers to a list of permissions that can be granted to specific users for specific pages. Unable to allocate different web pages to different CSS. Organizations that use Joomla as their CMS include: Heathrow Airport, Barnes & Noble, eBay, University of Alabama at Birmingham, Holiday Inn, Porsche, Guaranty Trust Bank, and Exact Software.